Ultra 85B is born with: A device to reduce speed when going round a bend; When traction stops so do the brushes and the supply of water; Acoustic alarm when reversing; Clean water level pilot light; Electronic float for the recovery tank. The suction motor is designed to be isolated inside a double-chamber carter which allows considerably reducing the noise and making cleaning operations very silent. For a more demanding clientele, the suction head has been designed to also contain the second, optionally supplied suction motor. The scrubbing head is equipped with two counter-rotating brushes and may move sideways to ease cleaning along walls and shelves. In case of a side impact, the base automatically retracts without requiring any control (it can absorb impacts). Thanks to an extremely user-friendly joystick, the scrubbing head is very easy to control. 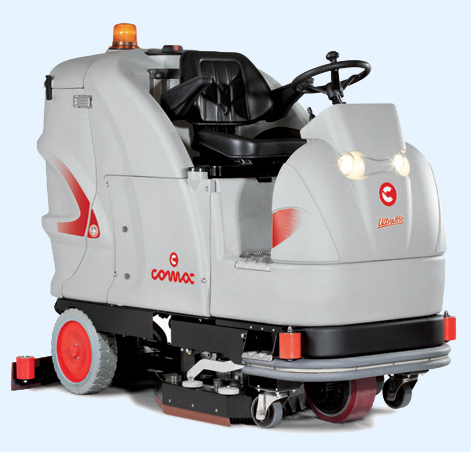 Thanks to a system developed by Comac, the squeegee can be rotated by the operator till reaching the horizontal position. This ensures a perfect cleaning of the squeegee rubbers and an excellent constant drying. The presence of the quick coupling fitting with level float allows filling up the clean water tank very quickly and conveniently.